Just Who is George Soros & How Does He Affect American Politics? "In December of 2006, Soros, who had previously hosted a fundraiser for Obama during the latter's 2004 Senate campaign, met with Obama in Soros's New York office. Just a few weeks later—on January 16, 2007—Obama announced that he would form a presidential exploratory committee and was contemplating a run for the White House. Within hours, Soros sent the senator a contribution of $2,100, the maximum amount allowable under campaign-finance laws. Later that week, the New York Daily News reported that Soros would support Obama rather than Hillary Clinton for the Democratic Party's presidential nomination, though Soros pledged to back the New York senator were she to emerge as the nominee. But it was clear that Soros considered Obama to be the more electable candidate of the two. Most importantly, Obama's economic and political prescriptions for America were wholly accordant with those of Soros. For an in-depth look at the shared agendas of Soros and Obama, click here." This is very interesting to say the least, and if one tracks information back far enough, they will find that Obama was on the board of directors of at least one group "bought and paid" for by George Soros. So the connections are there, but one just has to dig to find them! There is so much to show about this old man and what he has done so far that has nearly destroyed our United States! But let us show you just where he originated from as a beginning. George Soros was born to Tividar and Erzebat Schwartz, non-practicing Jews, in Budapest, Hungary on August 12, 1930. Tivadar was an attorney by profession, but the consuming passion of his life was the promotion of Esperanto—an artificial, "universal" language created during the 1880s in hopes that people worldwide might be persuaded to drop their native tongues and speak Esperanto instead—thereby, in theory at least, minimizing their nationalist impulses while advancing intercultural harmony. In 1936, Tivadar changed his family surname to Soros—a future-tense Esperanto verb meaning "will soar." When the Nazis occupied Budapest in 1944, Tivadar decided to split up his family so as to minimize the chance that all its members would be killed together. For each of them—his wife and two sons--he purchased forged papers identifying them as Christians; paid government officials to conceal his family's Jewish heritage from the German and Hungarian fascists; and bribed Gentile families to take them into their homes. As for George in particular, the father paid a Hungarian government official named Baumbach to claim George as his Christian godson, "Sandor Kiss," and to let the boy live with him in Budapest. One of Baumbach's duties was to deliver deportation notices to Hungary's Jews, confiscating their property and turning it over to Germany. Young George Soros sometimes accompanied the official on his rounds. Many years later, in December 1998, a CBS interviewer would ask Soros whether he had ever felt any guilt about his association with Baumbach during that period. Soros replied: "… I was only a spectator ... I had no role in taking away that property. So I had no sense of guilt." Soros today recalls the German occupation of Hungary as "probably the happiest year of my life." "For me," he elaborates, "it was a very positive experience. It's a strange thing because you see incredible suffering around you and the fact you are in considerable danger yourself. But you're fourteen years old, and you don't believe that it can actually touch you. You have a belief in yourself. You have a belief in your father. It's a very happy-making, exhilarating experience." Though Soros never studied directly under Popper, he read the latter's works and submitted some essays to him for review and comment. Most notably, Popper's 1945 book The Open Society and Its Enemies introduced Soros to the concept of an "open society," a theme that would play a central role in Soros's thought and activities for the rest of his life. The term "open society" was originally coined in 1932 by the French philosopher Henri Louis Bergson, to describe societies whose moral codes were founded upon "universal" principles seeking to enhance the welfare of all mankind—as opposed to "closed" societies that placed self-interest above any concern for other nations and cultures. (David Horowitz and Richard Poe, The Shadow Party (2006), p. 67) Popper readily embraced this concept and expanded upon it. In his view, the open society was a place that permitted its citizens the right to criticize and change its institutions as they saw fit; he rejected the imposed intellectual conformity, central planning, and historical determinism of Marxist doctrine. (Nicola Chalton, ed., Philosophers: Extraordinary People Who Altered The Course Of History (2008), p. 159) By Popper's reckoning, a society was "closed"—and thus undesirable—if it assumed that it was in any way superior to other societies. Likewise, any belief system or individual claiming to be in possession of "ultimate truth" was an "enemy" of the open society as well. Popper viewed all knowledge as conjectural rather than certain, as evolving rather than fixed. We have only scratched the surface of this man and what he does to entire nations with the networks he has set up, a few many may have heard of and a few some may think of as being purely fictional. We are going to skip a lot of what is in the middle of this man's life and get right down to what he has been engaged in the past few years. Let us begin by showing just a couple of the places that this man has an interest in! Health Care for America Now (HCAN) is a vast network of organizations supporting, ideally, a "single-payer" model where the federal government would be in charge of financing and administering the entire U.S. healthcare system. During the political debate over "Obamacare" in 2009 and 2010, HCAN's strategy was to try to achieve such a system incrementally, first by implementing a "public option"—i.e., a government insurance agency to "compete" with private insurers, so that Americans would be "no longer at the mercy of the private insurance industry." Because such an agency would not need to show a profit in order to remain in business, and because it could tax and regulate its private competitors in whatever fashion it pleased, this "public option" would inevitably force private insurers out of the industry. In August 2009, Soros pledged to give HCAN $5 million to promote its campaign for reform. Project Vote is the voter-mobilization arm of the notoriously corrupt ACORN, whose voter-registration drives and get-out-the-vote initiatives have been marred by massive levels of fraud and corruption. seeks "to help progressive organizations realize … electoral success by building and operating a robust national voter database." aims to "fully restore voting rights following criminal conviction"—significant because research shows that ex-felons are far likelier to vote for Democratic political candidates than for Republicans. seeks to "pass progressive legislation in all fifty states by providing coordinated research and strategic advocacy tools to forward-thinking state legislators." The Progressive Change Campaign Committee, to which George Soros personally donated $8,000 in 2010, works "to elect bold progressive candidates to federal office … more often." The American Prospect, Inc. is the owner and publisher of The American Prospect magazine, which tries to "counteract the growing influence of conservative media." Free Press is a "media reform" organization co-founded by Robert McChesney, who calls for "a revolutionary program to overthrow the capitalist system" and to "rebuil[d] the entire society on socialist principles." The Independent Media Institute aims to "change the world" via projects like AlterNet, an online news magazine calling itself "a key player in the echo chamber of progressive ideas and vision." The Nation Institute operates synergistically with the far-left Nation magazine, which works "to extend the reach of progressive ideas" into the American mainstream. Media Matters For America: For a number of years, the Open Society Institute gave indirect funding—filtering its grants first through other Soros-backed operations—to this "progressive research and information center" which "monitor[s]" and "correct[s] conservative misinformation in the U.S. media." In October 2010, Soros announced that he would soon donate $1 million directly to Media Matters. Sundance Institute: In 1996, Soros launched his Soros Documentary Fund to produce "social justice" films that would "spur awareness, action and social change." In 2001, this Fund became part of actor-director Robert Redford's Sundance Institute. Between 1996 and 2008, OSI earmarked at least $5.2 million for the production of several hundred documentaries, many of which were highly critical of capitalism, American society, or Western culture generally. In 2009, Soros pledged another $5 million to the Sundance Institute. The Alliance for Justice consistently depicts Republican judicial nominees as "radical right-wing[ers]" and "extremists" whose views range far outside the boundaries of mainstream public opinion. The American Constitution Society for Law and Policy seeks to indoctrinate young law students to view the Constitution as an evolving or "living" document, and to reject "conservative buzzwords such as 'originalism' and 'strict construction.'" Justice at Stake promotes legislation that would replace judicial elections with a "merit-selection" system where a small committee of legal elites, unaccountable to the public, would pick those most "qualified" to serve as judges. OSI has spent at least $45.4 million on efforts to change the way judges are chosen in many American states. We have shown just a very small part of what this man "Controls" with his money. You can review the entirety of the report here. Now let us take a very brief romp into George Soros's political interests. 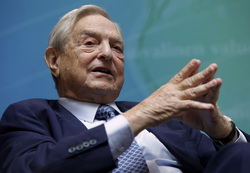 Apart from the more than $5 billion that Soros' foundation network has donated to leftist groups like those cited above, Soros personally has made campaign contributions to such notable political candidates as Charles Rangel, Al Franken, Tom Udall, Joe Sestak, Sherrod Brown, Harry Reid, Barack Obama, Hillary Clinton, Barbara Boxer, Ken Salazar, Patrick Leahy, John Kerry, Charles Schumer, Howard Dean, Bill Clinton, Tom Harkin, Jon Corzine, Joe Biden, Richard Durbin, Lane Evans, Dennis Kucinich, Maurice Hinchey, and Al Gore. He also has given large sums of money to the Democratic Senatorial Campaign Committee, the Democratic Senatorial Campaign Committee, and the Democratic National Committee Services Corporation." Around the time that George Soros initially launched his Manhattan-based Open Society Institute, he established what would prove to be a warm and enduring relationship with Bill and Hillary Clinton, the new American President and First Lady. When the Clintons took office in early 1993, they faced the daunting task of helping the collapsed Soviet empire rise from its ruins and cultivate a harmonious relationship with the United States. To lead this endeavor, President Clinton appointed three men: Treasury Department official Lawrence Summers, Vice President Al Gore, and soon-to-be State Department official Strobe Talbott. Talbott in particular was given a large degree of authority, prompting some observers to dub him as Clinton's "Russian policy czar." (The Shadow Party, pp. 89-90) It so happened that Talbot had an exceptionally high regard for the financial expertise of George Soros--describing him as "a national resource, indeed, a national treasure"—and thus he recruited the billionaire to serve as a key advisor on U.S.-Russian matters. Soros, in turn, had connections with a young economist whom he had been funding—Jeffrey Sachs, director of the Harvard Institute for International Development. The U.S. Agency for International Development assigned Sachs' Institute to oversee Russia's transformation to a market economy after more than seven decades of communism. As a consequence of this assignment, Sachs and his team essentially represented the United States as official economic advisors to Russian President Boris Yeltsin. Soros worked closely with Sachs on this project, and the pair held enormous sway over Yeltsin. (The Shadow Party, pp. 91-93) So great was their influence, in fact, that, on one occasion, Soros quipped that "the former Soviet Empire is now called the Soros Empire." But before long, members of Sachs's team became involved in massive corruption, exploiting for personal gain their access to Russia's political and economic leaders. Their actions contributed to the collapse of the Russian economy and to the diversion of some $100 billion out of the country. Though Sachs himself was not accused of profiting personally from these activities, he resigned as director of the Harvard Institute in May 1999, under a dark cloud of scandal. (The Shadow Party, pp. 93-94) The U.S. House Banking Committee investigated the matter and called Soros to testify. The billionaire denied culpability but admitted that he had used insider access in an illegal deal to acquire a large portion of Sidanko Oil. Soros further acknowledged in Congressional testimony that some of the missing Russian assets had made their way into his personal investment portfolio. House Banking Committee chairman Jim Leach characterized the entire sordid affair as "one of the greatest social robberies in human history." As the Nineties progressed, it became increasingly evident that Bill and Hillary Clinton embraced virtually all of the values and agendas that George Soros was funding through his Open Society Institute. "I do now have great access in [the Clinton] administration," said Soros in 1995. "There is no question about this. We actually work together as a team." Soros and Mrs. Clinton in particular held one another in the highest esteem. In November 1997, when Hillary was in Central Asia for a ribbon-cutting ceremony at the newly built American University of Kyrgyzstan, she delivered a speech in which she lavished praise on Soros's Open Society Institute, which had financed the school's construction. (The Shadow Party, p. 55) One source close to Mrs. Clinton's inner circle, Center for American Democracy director Rachel Ehrenfeld, reports that Soros visited Hillary at the White House during the Bill Clinton impeachment proceedings of 1998-99, when the First Lady was receiving only her most trusted confidants. (The Shadow Party, pg. 54) A few years later, at a June 2004 "Take Back America" conference in Washington, Mrs. Clinton introduced Soros as a courageous man who loved his country deeply. "[W]e need people like George Soros," she said, "who is fearless, and willing to step up when it counts." Soros, in turn, indicated that he was "very, very proud to be introduced" by someone for whom he had such "great, great admiration." He described Hillary as someone who had been "more effective than most of our statesmen in propagating democracy, freedom, and open society." Here we see that George Soros is heavily involved with both Bill and Hillary Clinton. So how in the world could anyone with half a mind support Hillary Clinton with Soros' money bags controlling what she does? We will stop here and continue on with this man showing that the once thought of "Shadow Party" is a very real organization, and one that has to be looked into if anyone is brave enough to do so. In part 2, we will show this along with more of the George Soros' influence and what he has done to destroy the United States through politicians from the President to the local state representatives! It is time for the people of the United States to wake up or forever be held as slaves!